Winemaker’s Notes: Aromas of blackberry, cherry, and black currants underlined with notes of vanilla and spice. Pair with bold fare. My Review: It was absolutely gorgeous here in Eastern North Carolina on Monday – bright, sunny, warm without being hot, and not a cloud in the sky. Otherwise known as perfect grilling weather. 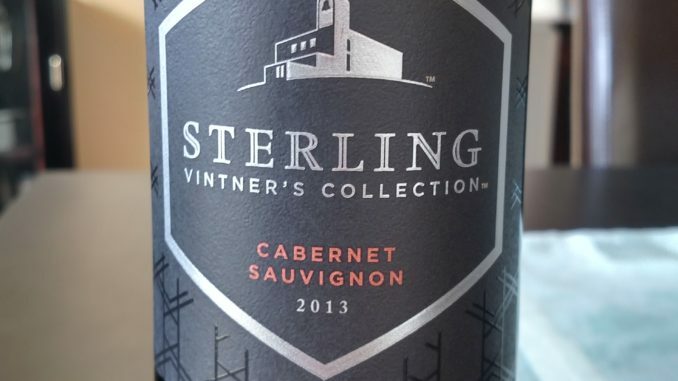 Picking up a steak and some asparagus to go with some russet potatoes I already had, I also grabbed a bottle of wine to open up with dinner – the 2013 Sterling Vineyards Vintner’s Collection Cabernet Sauvignon. In the glass the wine was a nice dark ruby color, and on the nose I picked up cherry and black currants. In the mouth the wine was medium-bodied, with the aromas of cherry and currants carrying through to the palate and being joined by a slate/mineral note that softened as the wine opened up. Paired with my steak the wine was great – enough tannins to balance the steak and the dark fruit notes were a perfect compliment to the red meat. While certainly not the greatest Cabernet I’ve had paired with a steak, it was a good value – $13 at the store when it drank more like a $20-25 wine means you’re not wasting your money. In many ways it’s exactly what you would expect out of a California Cabernet, but it does manage to avoid the fruit-bomb that I at least find a bit off-putting. In short, if you’re looking for a budget wine to pair with red meat over the summer grilling season, you can do a lot worse than this.